A fragment of bone claimed to be from St Nicholas - the 4th-Century saintly inspiration for Father Christmas - has been radio carbon tested by the University of Oxford. The tests in Oxford have been carried out on a fragment of pelvis, which had been in a church in France and is currently owned by a priest, Father Dennis O'Neill, from Illinois in the United States. 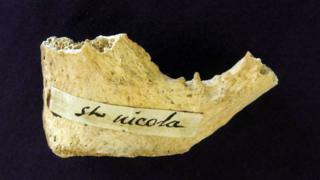 The radio carbon dating tests, for the Oxford Relics Cluster at Keble College's Advanced Studies Centre, have confirmed that the bone is from the correct era for St Nicholas. "This bone fragment, in contrast, suggests that we could possibly be looking at remains from St Nicholas himself," says the Oxford archaeologist. And the researchers now want to use DNA testing to see how many bones are really from a single individual - and how many might be linked to the bone tested in Oxford. Dr Georges Kazan, co-director of the centre at Keble College, says: "It is exciting to think that these relics, which date from such an ancient time, could in fact be genuine." "Science is not able to definitely prove that it is, it can only prove that it is not, however," says Prof Higham.